Home » Opus Downtown Vancouver: Grand Opening Events! Opus Downtown Vancouver: Grand Opening Events! Join us for an art-filled February at our New Opus Downtown location! You’re invited to our new Opus Downtown Vancouver location for a February filled to the brim with creative and inspiring activities! Join your creative community for live painting events, lunchtime life drawing sessions, a large scale paint pour, and artist demonstrations. Participate in a photo scavenger hunt challenge and enter to for a chance to win our grand prize of a $1,000 Opus Shopping Spree! Get in on all the art action! Participate in one (or all) of our February events! Community Art Project: Pouring Party! Drop in, no registration necessary. Opus Art Supplies invites you to check out our newest location at Harbour Center and be a part of a community art project – a large-scale paint pour! Acrylic pours are a fun and easy way to get started in abstract painting, creating fluid patterns governed by chance and guided by you! Drop by to check out our new store and try your hand at a letting colours pour, drip, and move across the canvas to create one-of-a-kind works of art. Whether you've never painted before or are an experienced artist, this is a great chance to try something new! The finished piece will be on display at Opus Art Supplies in Harbour Centre for our February 16th Grand Opening Celebration. Thank you to Liquitex for their generous materials sponsorship of this event! Take part in a free, drop-in life drawing session! Warm up with a series of short poses, and then move on to longer standing and seated poses. Come with a sketchbook to use with the Conte crayons we'll be providing or bring your favourite drawing materials. We're setting up to do a little en plein air painting! 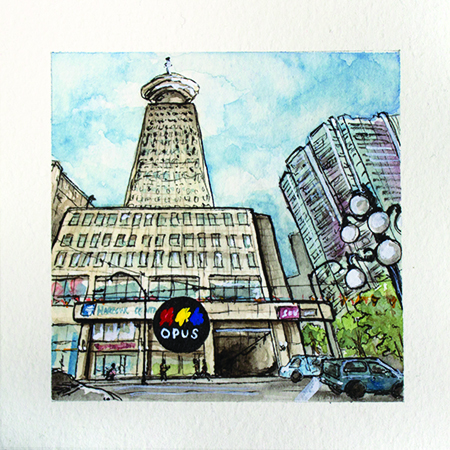 Visit our on-site artist outside of Waterfront Station as they sketch and paint their surroundings. Seating is limited, register to today at 604‑678‑5889 to save your spot! Megan will demonstrate a selection of new mediums and methods for watercolour. She will discuss the differences and uses between watercolour grounds, as well as a fun and easy monoprinting technique using watercolour. Fundamentals of watercolour technique, such as washes, masking, using salt, gradients, wet on wet, lifting, and more will also be covered. For more details, please visit this demo's event listing on our Demonstrations page. No registration necessary, follow @opusartsupplies on Instagram to get in on the fun! Get creative with your camera and get to know the neighbourhood. Follow @opusartsupplies on Instagram and watch for our posts and stories starting February 12th as we reveal what you can capture to earn points towards prizes. 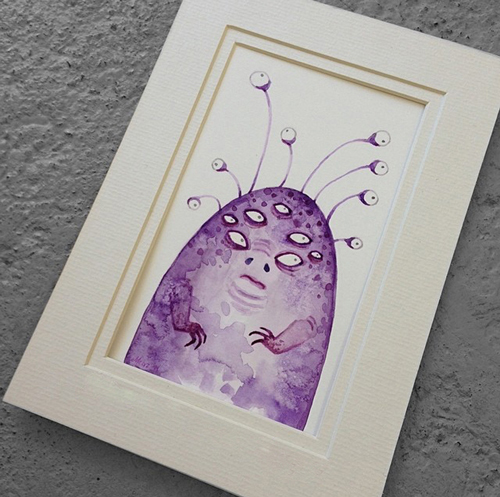 Then post your pics on IG with @opusartsupplies and #opusdtgo to play along and earn points for your chance to win! 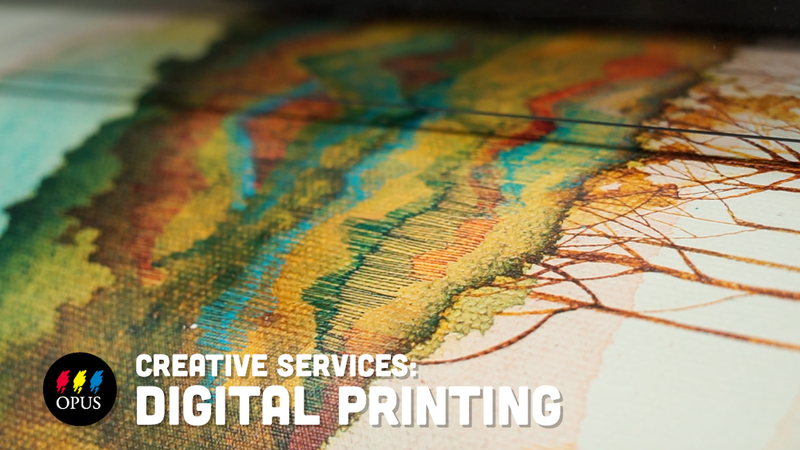 Earn the top points to receive a Fine Art Digital Printing Package from Opus! * Secondary prizes include swag from Liquitex - umbrellas, tumblers, and more! Anytime before February 15th at 8pm PST - Winner will be announced on February 16th at our Grand Opening Celebrations and on Instagram! There are 10 photos for you to find. Score as many points as you can from the list below to win! Post anywhere from 1 to all 10 of the shots - you don’t need to capture all of them to play! You can post individual photos or post several images to an album - both will count towards your score. There are no additional points for multiple images of the same prompt. * Please note that, while we'll do our best to capture every post and story that has been tagged with both @opusartsupplies and #opusdtgo, due to the nature of Instagram, we can't guarantee all posts will be recorded. We appreciate your participation in this event and thank you for your understanding. In the case of a tie in top points earned, a secondary draw with all tied top points participants will take place to select the winner. The top prize is limited to one Facemount Print up to 18" × 24" in size on gloss photo paper or Moab Slickrock redeemed by winner of the 2019 Instragram Photo Scavenger Hunt. Available in-store only at Opus locations throughout BC; not available online or for phone orders. The winner will be presented with the voucher at the Grand Opening Celebrations on February 16 or can pick up the voucher upon presenting photo ID to store management, when they next visit Opus Downtown Vancouver. Voucher expires February, 16, 2020. Voting is open! Click to view & vote for your favourite pieces! Join us for 2 days of Live Paint Battles at Harbour Centre's Atrium. Each battle features 4 painters, 2 rounds, and 1 victory! Watch as local artists bring brush to canvas in two 30 minute rounds, cheer them on as they paint, and vote for your favourite pieces! & vote for your favourite pieces! Due to snowy weather conditions, we have introduced an online voting component to our Live Paint Battle. Online votes will be combined with votes received in person to determine the winners announced on Saturday, February 16th at our Grand Opening Celebration at 4pm. Each artist has painted a 30 minute painting in round 1 and a 45 minute painting in round 2 for their chance to win a $500 Opus Gift Card! Bid on your favourite pieces from the February 12th & 13th Live Painting Battles! The works will be installed and on display at Opus Downtown Vancouver on February 16 for Silent Auction, and you'll be able to be bid on until the end of the festivities. 70% of the proceeds of each piece goes to the artist and 30% to the Art Therapy Program at Covenant House! Join us for a hands-on demonstration with Liquitex artist Tony Zatzick and explore NEW Liquitex Gouache and Liquitex Soft Body Acrylics. 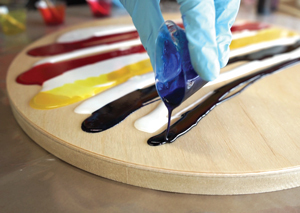 Discover the working properties of Liquitex Professional Acrylic Gouache and Liquitex Professional Soft Body Acrylic, exploring their differences, similarities, and intermixability. The new launch of Liquitex Professional Acrylic Gouache introduces 50 colours that are semi-opaque, non-cracking, water-resistant, dry matte, and in a new ergonomic bottle design. Also, rediscover Liquitex Professional Soft Body Acrylic - the same great formula, now in a new easy-to-use squeeze bottle for more comfort and less waste. Learn about complete compatibility with entire line of Liquitex paint ranges and mediums, such as sprays, markers, inks, heavy body , traditional fluid, gel mediums, texture gels, effects mediums such as Pouring Medium and String Gel. Tony will also discuss the similarities and differences of these paints on a variety of of surfaces such as, absorbent vs primed surfaces and canvas, panel and paper. In addition to our current OpusPLUS Member Sale, we're waking up your weekend with even more materials on sale! Be sure to visit an Opus Art Supplies store near you during this sales event and sign up for our email newsletter to see what's on sale. You're invited to join us for a day full of art activities! All events are drop in, no registration necessary. Bid on your favourite pieces from February 12 & 13's Live Painting Battles! The works will be installed and on display for Silent Auction and able to be bid on until the end of the festivities, with 70% of the proceeds going to the Artist and 30% to Covenant House's Art Therapy Program! 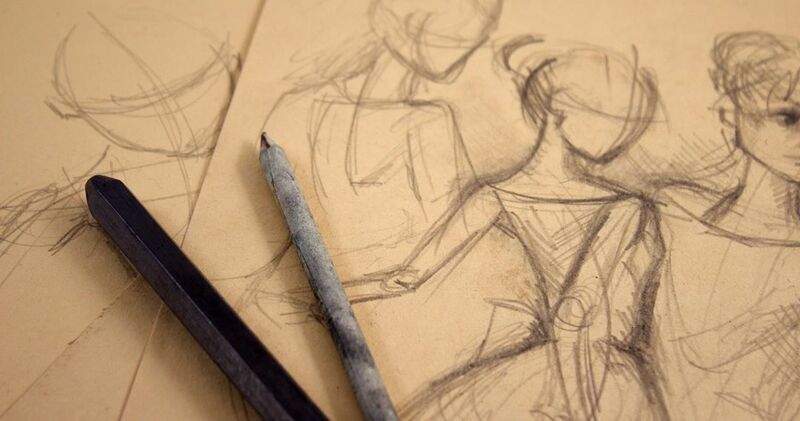 Take part in a free, drop-in life drawing session! Warm up with a series of short poses, and then move on to longer standing and seated poses. Come a sketchbook to use with the Conte crayons we'll be providing or bring your favourite drawing materials. Visit our screenprinting station and pull a ‘By All Means Create’ graphic print of your very own! Kids and adults alike are invited to spend a little time with our face painting artist to add a little colour to their day… and their face! Many thanks to Snazaroo for their sponsorship of this event. Join us for refreshments and to find out the winners of our Live Painting Battles, Instagram Scavenger Hunt, and our Grand Prize of a $1000 Opus Shopping Spree! 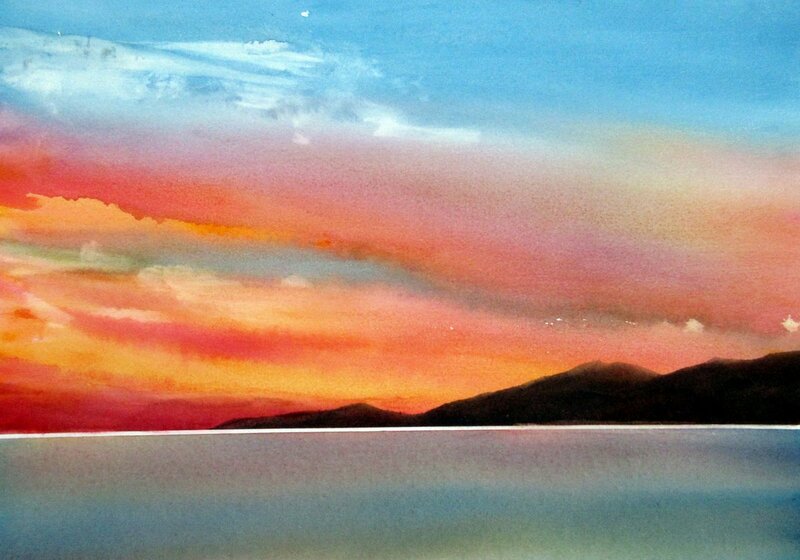 Watercolour is the most natural medium for painting skies. Enda will demonstrate how to capture the changing light and shifting clouds to unleash their drama by using wet-in-wet technique. She will also show you how to paint spontaneously, adapt, and recover, allowing the paint to naturally flow and blend on paper with a limited palette. You will also learn how the degree of dampness of the paper, and use of brush strokes, can create your desired effect.